The Imperial Sewers are the sewer system of the Imperial City. For those who own the DLC or are members of ESO Plus, the sewers serve as the means of entry to the city. Each entrance can be used by players from any Alliance, and upon entry, they will be ported straight to their own Alliance's base of operations. 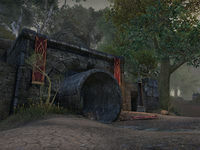 The Imperial Sewers plays similarly to a Public Dungeon, but with PvP in all areas except a few small alliance safe zones. The alliance safe zones contain ladders that go to all the city districts, leading to small rally points in the city. The only way to get back to the sewer safe zone if one has left the rally point is to use one of the ladders on the edges of the district, which connect to deeper parts of the sewers, and then walk back to the alliance base. Within the sewers are three different alliance-based branches that all converge to the central Barathrum Centrata. Each branch contains four group boss champions, two striking locales, two district ladders, and a total of seven skyshards spread out among them. The Coldharbour Elite Guard, a powerful group of xivkyn group bosses, patrol paths through the sewers, and Cunning and Trove Scamps also spawn at rare times. 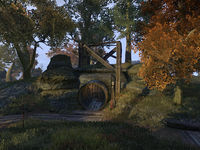 The sewers contain three entrances to the White-Gold Tower, and three entrances to the Ancient Underground, all in close proximity to alliance bases. 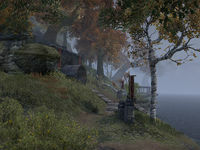 Exiting the sewers will transport you back to the Border Gates, rather than returning you to the Lake Rumare shoreline. Many portals can be found scattered throughout the sewers. Closing all three portals in the center of the Barathrum Centrata will summon the Simulacrum of Molag Bal. 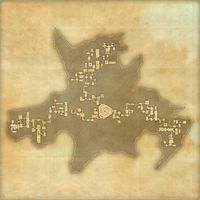 The Imperial Sewers map is missing a passage in the Alessian Tombs that goes beneath the area with Secundinus the Despoiler. This page was last modified on 19 January 2019, at 23:28.